Everyone in my family loves noodle based dishes. So I work hard to find a variety, and especially ones that include plenty of vegetables. This recipe was just the ticket. 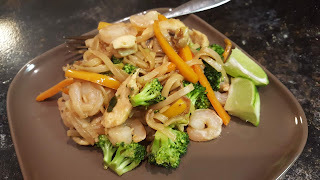 I added two kinds of protein to the typical "drunken noodles" and several varieties of vegetables. 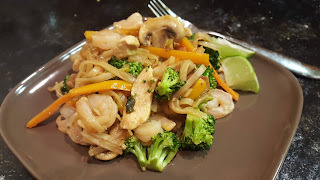 I used our favorites: broccoli, peppers and mushrooms, but you could use your favorites - zucchini, asparagus and bok choy would all be delicious. This is a great weeknight dinner that comes together quickly - and only dirties one pot! Make yourself some drunken noodles tonight! Make sauce: Whisk together soy sauce, brown sugar, Sriracha, and lime zest. In a large skillet over medium heat, heat oil. Add garlic and ginger and stir until fragrant, 1 minute, then add chicken. Stir and cook until chicken is cooked through, about 3 minutes. Remove chicken to a bowl. Heat the skillet again, then add green onions. Cook until softened, 2 minutes. Add peppers, broccoli and mushrooms and cook until tender, about 5 minutes. Add noodles and toss until completely combined. Pour sauce over noodles and and toss until combined. Adc in the cooked chicken and shrimp and stir until combined. Garnish with fresh basil and lime wedges, if you like. Makes 4 servings. 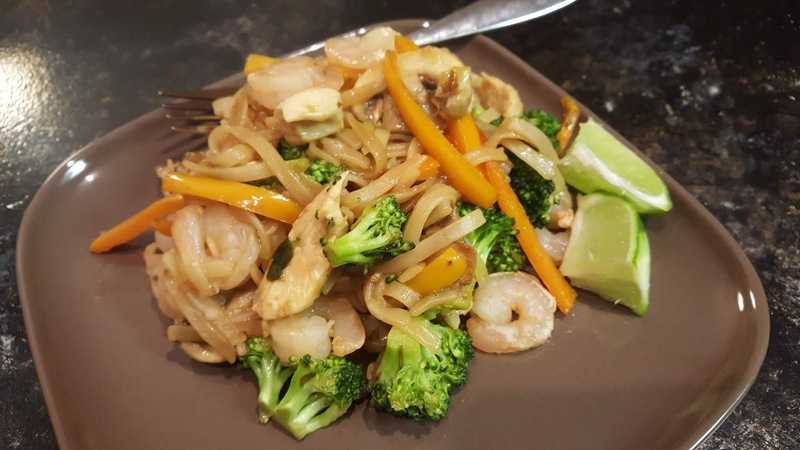 I love Thai food, and I especially love being able to make great restaurant-worthy dishes at home. This is one of them. I especially love when I find a recipe that meets my weeknight trifecta: fast, easy and delicious. This is one of them. 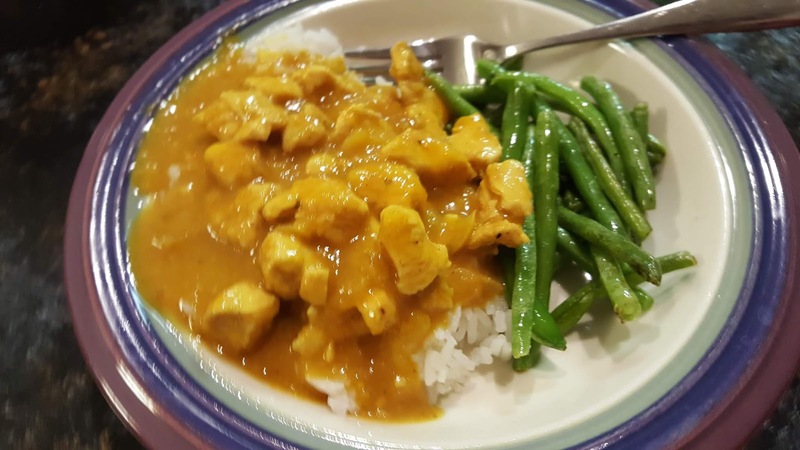 This is such a great curry dish. It's so convenient to whirr the sauce together in the blender and then add it to the stir fry. The extra flavor burst from the mango just takes this over the top. 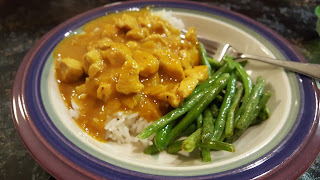 We enjoyed it served over rice (and cauli rice!) with stir fried green beans. I hope you love it as much as we do. For the sauce, in a blender, combine all the ingredients and process until smooth. Set aside. For the chicken, in a large, nonstick skillet, heat the olive oil over medium heat and add the onion, garlic, and ginger. Cook until the onion softens, 2-3 minutes. Add the chicken pieces dry to the skillet. Cook, stirring often, until the chicken turns white on all sides but isn't cooked through all the way, 1-2 minutes. Add the curry paste, curry powder, salt and pepper, and cook, stirring constantly, until the mixture is fragrant, 1-2 minutes. Add the sauce mixture and stir well. Bring to a simmer, stirring often to make sure the curry paste and curry powder are fully dissolved. Simmer for 10-12 minutes, stirring occasionally and adjusting the heat to prevent burning, until the sauce has thickened slightly. Serve on rice with cilantro to garnish, if you wish. Makes 6 servings. So here we have a Valentine's Day dessert obviously displayed on a Christmas plate. Hmmm. 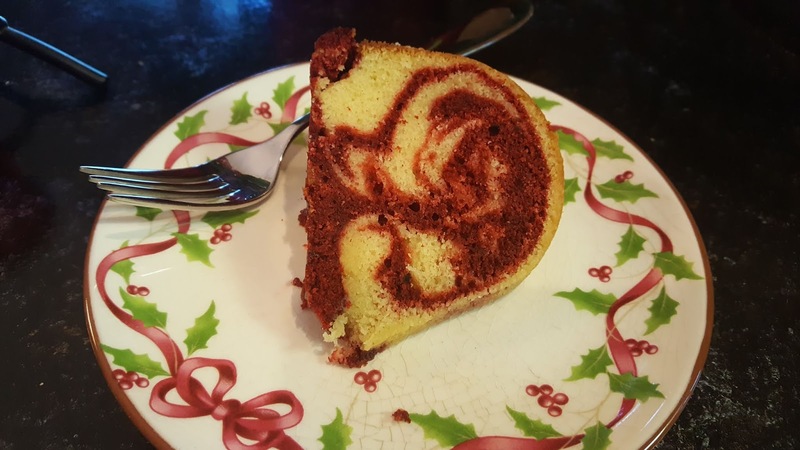 Well, the easiest explanation is that I made this at Christmas, but also think it's a wonderful cake for Valentine's, with the beautiful red swirl. It's the easiest and the most true. So don't mind the Christmas plate - just look at the cake. 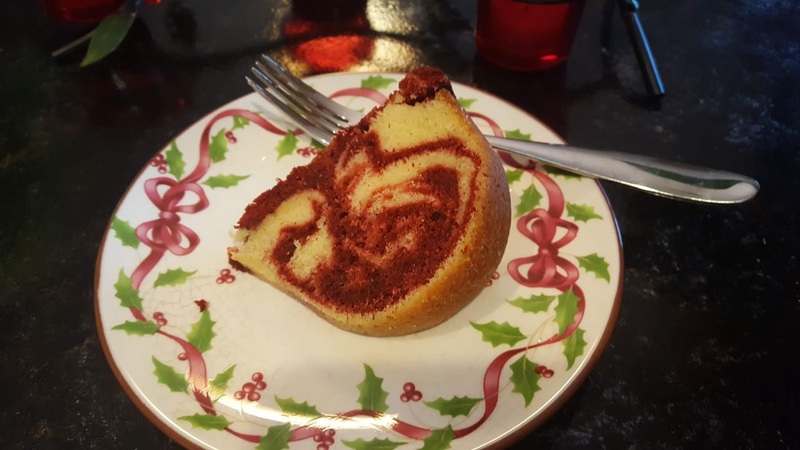 This is a wonderfully rich cake with swirls of red velvet in the vanilla batter. It doesn't need a frosting or any kind of icing - it's divine just on its own. So, whether you make it this week for Valentine's, or pin this recipe and save it for Christmas, it doesn't matter. Any holiday that needs an infusion of red and deliciousness is the right holiday for this cake. In a large bowl, with an electric mixer, beat together butter, sugar, and sour cream until well-combined. Stir in vanilla. Add eggs one at time, mixing well after each addition. On low, stir in flour mixture until just incorporated. Stir in milk. In a separate large bowl, stir together 2 ½ cups of the batter, cocoa powder, milk, and red food coloring. Using a 1/4-cup measuring cup, drop two scoops of plain batter into a greased and floured bundt pan. Drop one scoop of red velvet swirl batter on top of plain batter. Continue to alternate between plain and red velvet swirl batters until both batters are gone. Bake at 350 for 50-60 minutes, or until a wooden toothpick inserted into the center comes out clean. Cool cake in the pan on a wire rack for 30 minutes. Invert the cake onto wire rack, and cool completely. Well, we barely survived the Polar Vortex 2019... just kidding, we survived just fine. But here in Minnesota, we're expecting more snow and cold temps again this week. Time to make soup! 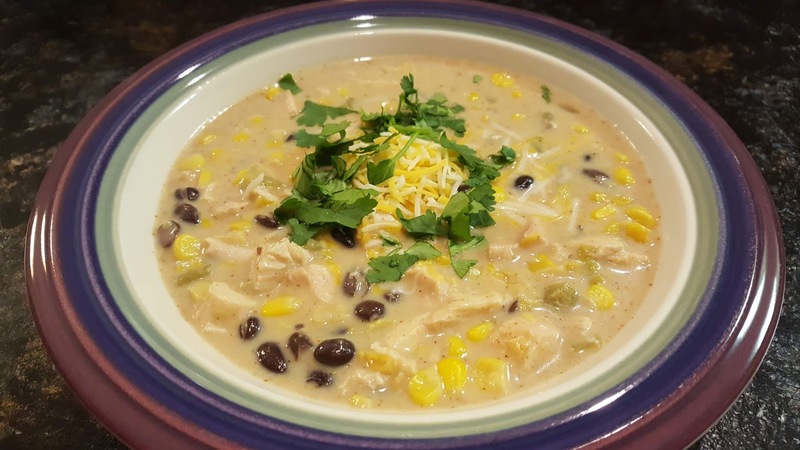 We love soups that have Mexican flavors, and so when I saw this one, I knew I wanted to try it. 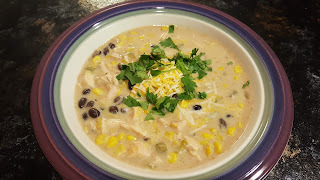 It's similar to the chicken tortilla soups I've made, but you can never have too many Mexican soups in your repertoire, in my opinion. 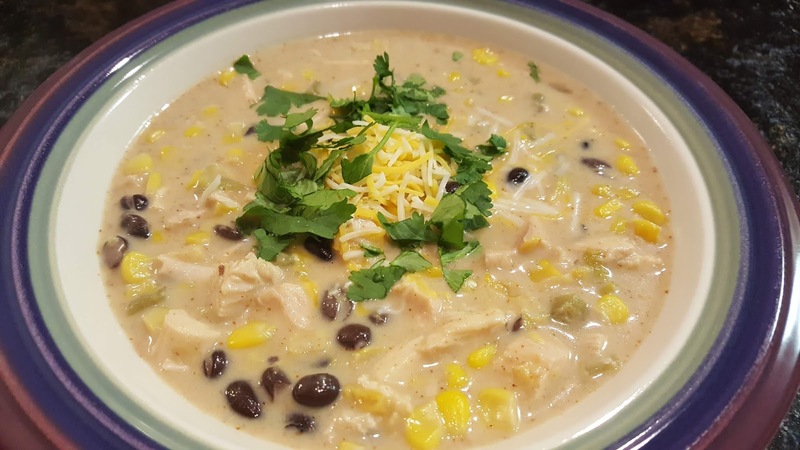 I actually served this with chips and guacamole, but you could also add all kinds of fun toppings right to your soup: avocados, cilantro, sour cream, salsa, etc.! I especially like soups that can cook in the crock pot, making meal planning a breeze, and making your house smell heavenly when you walk in after work! I also love how easy and convenient soup leftovers are to take for lunch on the next day. Stay warm out there, and eat plenty of soup! 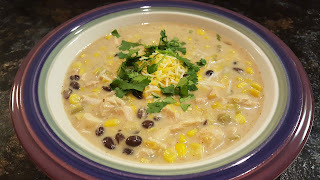 Add the chicken, garlic, broth, creamed corn, fire-roasted corn, black beans, diced green chiles, chili powder, paprika, and cumin to the crockpot. Return the shredded chicken, and add the cheese and half and half. Stir well to incorporate all the cheese and cream. Season to taste with salt and pepper. Here's a super healthy and delicious dinner for the New Year. Cod is a mild white fish that will absorb the flavors that you use with it. Here, it gets a little sweet/savory treatment that is reminiscent of Japanese or other Asian flavors. 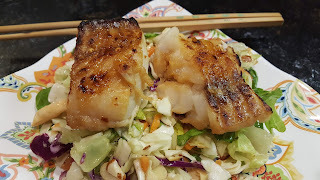 In this recipe, the cod is broiled, so it is ready in a flash, and the broiling also creates the nice crust from the honey. It does need a few minutes to marinate, or a few hours if you've planned ahead, but then dinner will be ready in a snap. I served this over a chopped Asian salad, the kind in a bag with the almonds and wonton strips... it was super easy to throw this together while the fish cooked, and the crunchy salad paired really well with the soft fish. I would even dare to call it restaurant worthy! I hope your family enjoys it as much as we did. Find more inspiration at Hearth and Soul, Inspiration Monday, Busy Monday, Inspire Me. Set broiler temperature to high; move oven rack to 7 inches below the broiler element. 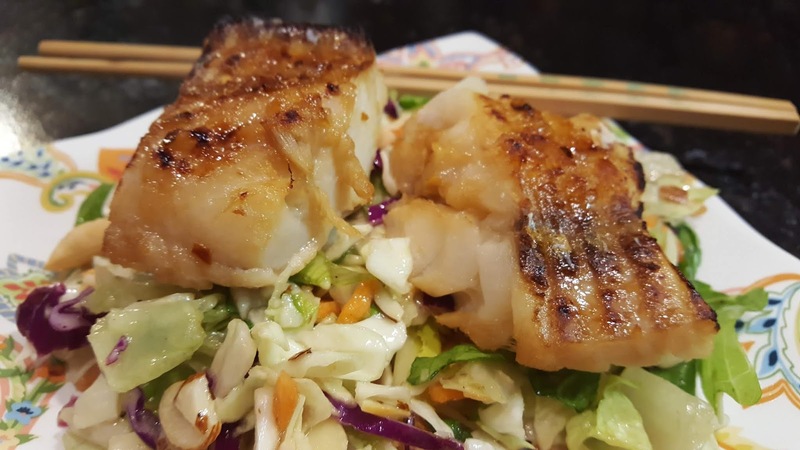 Grease a small baking sheet, and add the cod, pouring the marinade over the top. 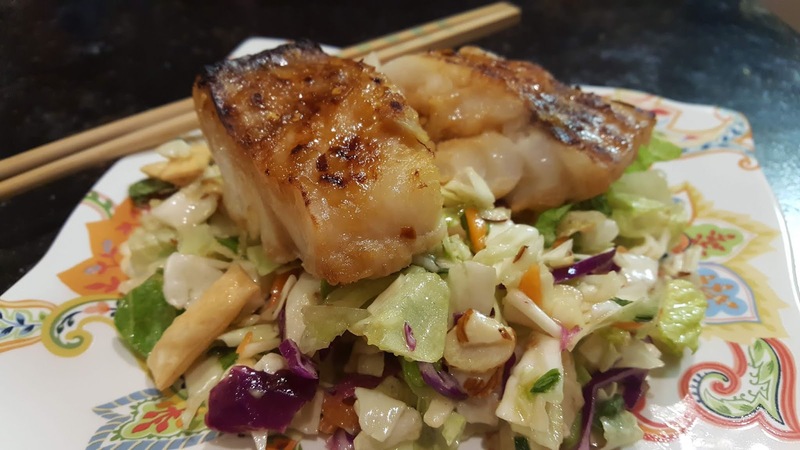 Serve over Asian chopped salad, or with rice and fresh steamed vegetables. I love Shepherd's Pie. But I don't love the time commitment it takes to get it to the table - especially on a weeknight. So you can imagine how excited I was to see this version in one of my last issues of Cooking Light. 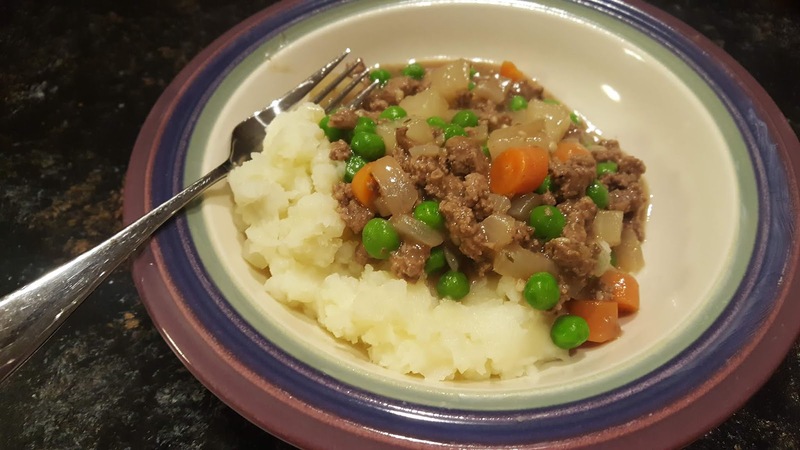 This shepherd's pie requires no baking - you just spoon what would normally be the bottom over what would normally be the top! Confused? 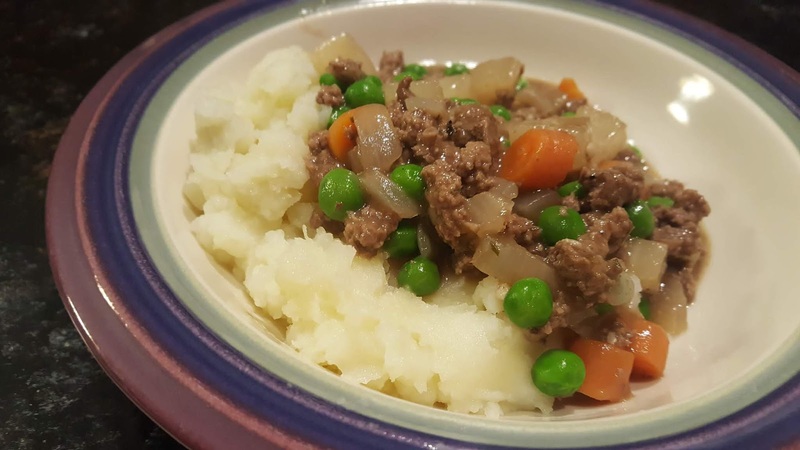 It's easy really - mash some potatoes, and cover them with a fantastic beef and veg mixture. What was even more fun for me? Buying and cooking turnips! I have never bought them before, and so I obviously hadn't cooked with them before, but they're "native" to this dish, so too important to leave out. 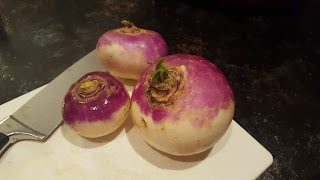 (You can sub parsnips if you want...) When I posted this pic on Insta, I got lots of other great ideas about what do to with them, too, so stay tuned for more turnip recipes! Anyway, back to the Shepherd's Pie...It was a huge hit with everyone in my family. Several asked if they could take it for lunch the next day, which is the sign of a great dinner. 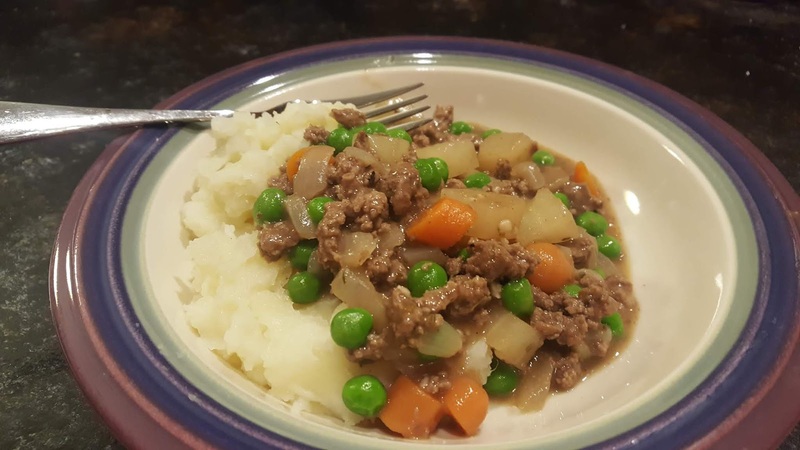 With wholesome ingredients, ease of prep, and widespread likeability, this dish will be a regular in our rotation, I'm sure. Find more great ideas at Inspiration Monday, Busy Monday, Inspire Me, Hearth and Soul, Full Plate, Let's Party, Wow Me, Weekend Potluck. Start by preparing the mashed potatoes. Place the cut up potatoes in the Instant Pot and cover with water. (Don't use more water than just to cover the potatoes.) Set for high pressure for 6 minutes and release the pressure. Drain the potatoes, return to the pot and add milk and butter and then mash to your desired consistency. Alternatively, cook the potatoes in a large saucepan on the stove until tender, then drain and mash with butter and milk. Meanwhile, while potatoes are cooking, heat the oil in a large nonstick skillet over medium-high heat. Add the beef; cook 6 to 7 minutes or until browned, stirring to crumble. Add the onion, turnip, carrot, rosemary, and garlic to pan; cook 6 minutes or until vegetables are tender, stirring occasionally. Sprinkle the flour over the vegetables and meat. Add stock to the pan, and stir well to absorb the flour, then bring to a boil. Reduce heat to medium, and simmer 4 minutes or until thickened. Stir in peas, pepper, and salt. To serve, scoop potatoes into shallow bowls and top with beef and vegetable mixture. Makes 6 servings. 1) It must be delicious. 2) It must be fast. 3) It must be easy. This recipe ticks all 3! Place all the ingredients in the IP, and let it cook away. Make some cauli or regular rice while it's cooking, and after it's done, stir in the coconut milk. 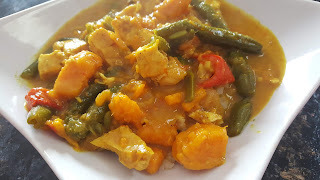 You'll have a veggie packed, delicious curry and supper is ready! I love all different kinds of curries (both red and green Thai varieties will appear here soon!) 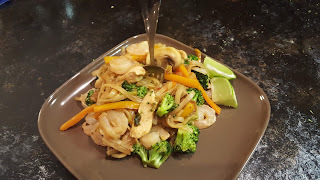 and while I usually make them on the stove top similar to a stir fry, I love how the IP cooks all these ingredients together with great success. Amp up your mealtime with this great Sweet Potati and Chicken Curry. It's a Happy New Year all around! Find more inspiration at Hearth and Soul, Fabulous, Let's Party and Full Plate. Set your Instant pot to the saute setting. Add the coconut oil, onion, and garlic and saute until onions are translucent. 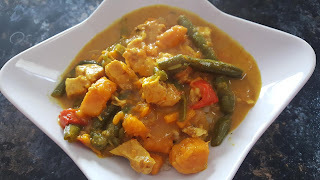 Add the chicken, sweet potatoes, red pepper, green beans, broth, curry, cumin, turmeric, cayenne and sea salt. Seal the instant pot and use the manual setting to set time for 12 minutes. Once time is up, release the pressure by switching from seal to vent. Once pressure is released, remove lid and turn Instant Pot to saute setting. Stir in the coconut milk and let cook for an additional 2-3 minute or until the mixture is hot. Serve over rice or cauliflower rice and top with cashews and fresh cilantro. Serves 4-6.